FORT DEL PILAR, Baguio City — Outgoing Philippine National Police (PNP) chief Dir. Gen. Ronald Dela Rosa is ready to face a possible wave of charges linked to the thousands of deaths under the government’s anti-illegal drug campaign once he retires from service. Dela Rosa, who has led the government’s deadly drug crackdown, said that he would not leave the side of President Rodrigo Duterte, whom he described as giving him the biggest break of his uniformed career. “Handa ako (I am ready). 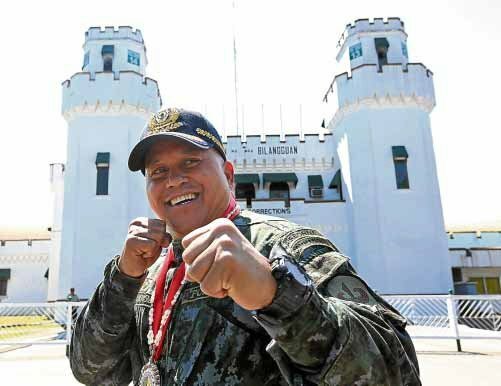 As I’ve said, I may sink or swim with my President, hindi ko siya iiwan (I will not leave his side),” Dela Rosa said in an interview here on Monday after the Philippine Military Academy’s (PMA) testimonial parade held in his honor. Dela Rosa will retire on April 19 and turn over his position to National Capital Region Police Office (NCRPO) chief Dir. Gen. Oscar Albayalde, his mistah at the PMA Sinagtala Class of 1986. During his 21-month term as police chief, Dela Rosa led the PNP to wage the deadly anti-illegal drugs campaign, which is believed to have killed thousands of suspected drug criminals since July 2016. The PNP has said nearly 4,000 drug personalities have been killed in the nearly two-year intensified campaign against illegal drugs. It says most of the fatalities were killed while putting up violent or deadly resistance during police operations.